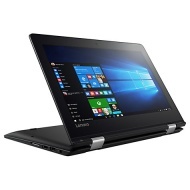 alaTest has collected and analyzed 14 reviews of Lenovo Yoga 310 Laptop, Intel Pentium, 4GB RAM, 128GB SSD, 11.6", Black. The average rating for this product is 4.5/5, compared to an average rating of 4.1/5 for other products in the same category for all reviews. Views about the size and screen are on the whole positive. The performance and portability also get good feedback. We analyzed user and expert ratings, product age and more factors. Compared to other products in the same category the Lenovo Yoga 310 Laptop, Intel Pentium, 4GB RAM, 128GB SSD, 11.6", Black is awarded an overall alaScore™ of 88/100 = Very good quality. Fabulous piece of kit for its size / cost!! This so far has turned into a great and very light piece of kit for use on the move - it's also pretty quick. I'm really please especially for the size / value. It came down £70 2 weeks after I bought it? Not very happy. Good easy to use laptop. Found the instructions on how to set up very easy I am a silver surfer and normally need lots of help but did this on my own. Bought for my step daughter who loves it but has complained that the camera does not work. She'd not bothered about that as she doesn't need the camera but hence the dip in marks awarded. I helped set up the laptop and it took only 10 minutes. Phew!